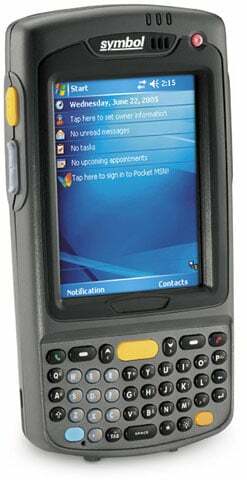 Symbol MC70 - Windows Mobile 5.0 OS with 64MB RAM/128MB ROM, WLAN/PAN, 802.11a/b/g and Bluetooth, 26 key numeric keypad, 1D scanner. Cradles, power supply and communication cables not included. See accessories. The Symbol MC70 is a rugged, compact, lightweight TNT-based portable data terminal with standard wireless connectivity using WAN/LAN/PAN and Bluetooth. Key features include a color 1/4 VGA display, 1D Laser Scanner/2D Imager, Converged voice and data (Voice over LAN/WAN), User-accessible memory (SDIO) and Windows Mobile 5.0 OS. The MC70 is built to an industrial specification in terms of drop, temperature and sealing, giving industrial users and others in harsh operating environments the ultimate in durable connectivity. The Symbol MC7090-PU0DJRFA8WR is also known as Symbol Technologies	SYM-MC7090PU0DJRFA8R	or MC7090PU0DJRFA8WR	.